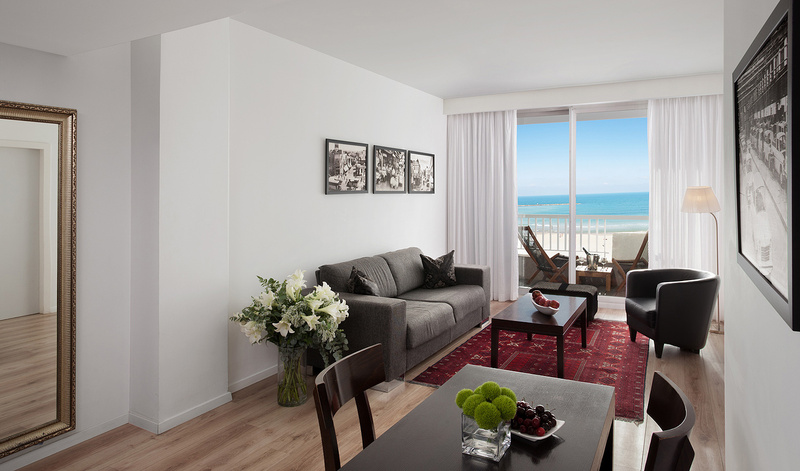 Perfectly located on the beach in the heart of Tel Aviv, Sea Executive Suites is a haven of serenity and relaxation within the vibrant, nonstop life of the city. 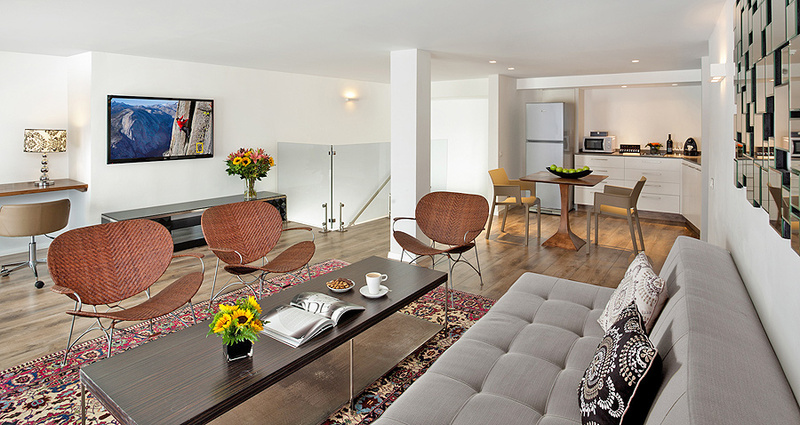 All our facilities and accommodations are beautifully designed with modern furnishings, which offer a feeling of comfort and relaxation, coupled with the highest quality of service. Sea Executive Suites is perfectly located within a short walking distance from all major must-see Tel Aviv landmarks, shops, bars, restaurants, bus stations, banks and other local hot spots. Regular Season: 03/01 / 2017-06 / 04/2017 14/04 / 2017-31 / 07/2017 27/08 / 2017-23 / 12/2017 Cancellation accepted up to 2 days before date of arrival at 12:00 , No cancellation fee will be charged, in case of cancellation after 12:00 or in case of non-arrival without notice, the full cost of the reservation will be charged. Cancellation of peak season and holidays: 07/04 / 2017-18 / 04/2017 01/08 / 2017-26 / 08/2017 24/12 / 2017-31 / 2017 Cancellation accepted up to 7 days before date of arrival at 12: 00, no cancellation fee will be charged, in case of cancellation after 12:00 or in case of non-arrival at no charge, the full cost of the reservation will be charged. Luxury SuiteThe Luxury Suite is great for couples celebrating their engagement or anniversary, birthdays and special occasions. This 50 square meter (540 square feet) suite resembles a spacious one bedroom apartment featuring a luxurious indoor Jacuzzi, a comfortable sleeper sofa in the living room, a fully functional kitchenette, elegant parquet flooring and a charming furnished wooden deck balcony. 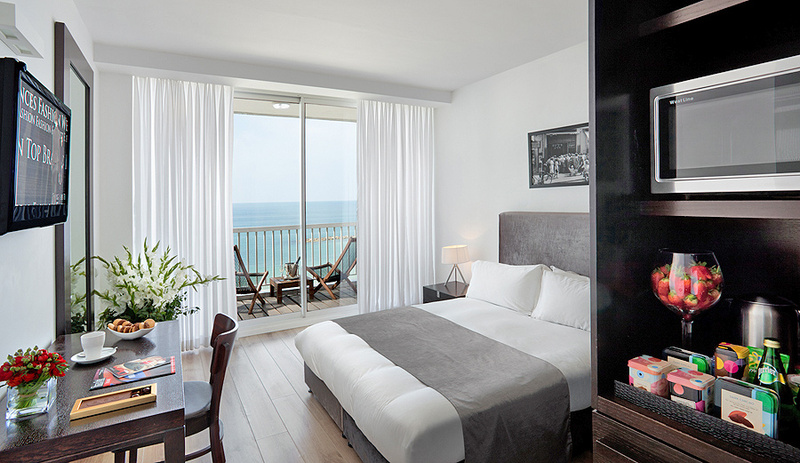 Mediterranean Sea View Suite With all the amenities of home, the large 80 square meter (860 square foot) Mediterranean Suites comfortably caters up to four guests, with the addition of high end experience expected from a boutique hotel. 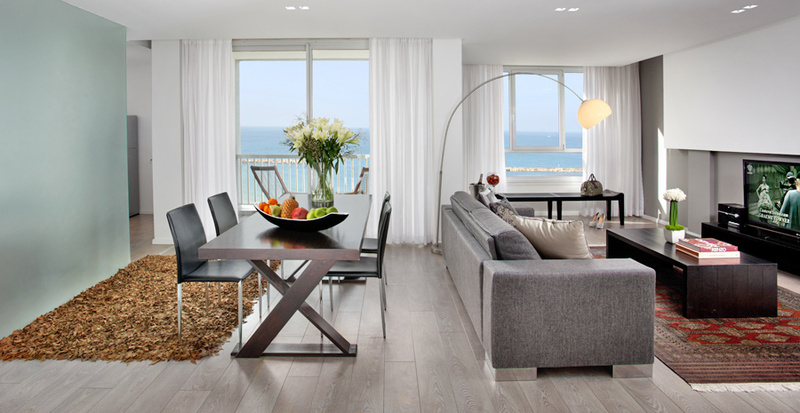 Located on the 8th floor, this one-of-a-kind suite features a breath-taking panoramic view of the Mediterranean Sea, high loft-style ceilings, an adjustable master bedroom with private Jacuzzi, huge living room together with a fully functional, spacious kitchen. Complex SuiteA specious 2 rooms with connecting door, 2 bathrooms and a shared living room, this complex is suitable for a family of 6 or 2 couples. 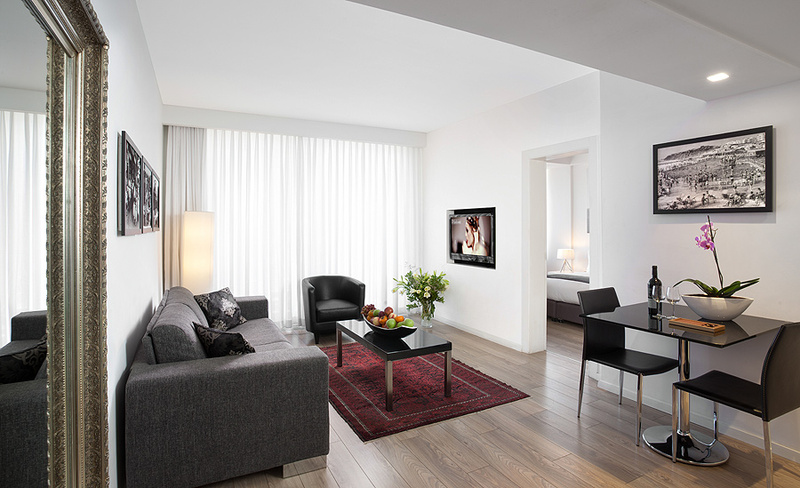 Our complex have 3 LCD TVs of 32", 2 safes, 2 mini bars, electric kettle, coffee and tea service and free Wi-Fi access . Two Bedroom Suite Sea ViewThis spacious 65 square meter (700 square foot) provides both comfort and relaxation for up to six guests. The suite boasts two adjustable bedrooms (option for queen sized or single beds), a large living room with a comfortable sleeper couch, fully functional kitchen, and a charming, furnished wooden balcony directly overlooking the Mediterranean Sea. One Bedroom Suite Sea ViewThe 50 square meter (540 square foot) One Bedroom Sea View Suite is ideal for families and small groups of up to 4 guests. This suite is designed to resemble a classic one bedroom apartment for the ultimate home away from home vacation with a comfortable sleeper sofa in the living room, a fully functional kitchenette with breakfast area, elegant parquet flooring, and a charming furnished wooden balcony overlooking the Mediterranean Sea. One Bedroom SuiteThis 50 square meter (540 square foot) suite is a great fit for families, small groups and extended business trips. The spacious one bedroom apartment can host up to four guests at a time and features a comfortable sleeper sofa in the living room, a fully functional kitchenette and breakfast area, elegant parquet flooring and a charming furnished wooden deck balcony overlooking Old Jaffa and a glimpse of the Sea. 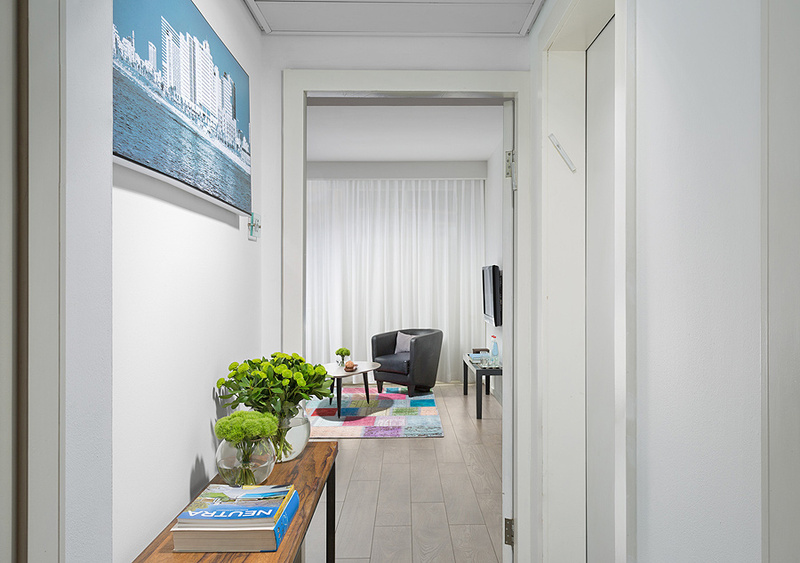 Business SuiteWith its own private entrance, the 60 square meter (645 square feet) Business Suite is the ideal place to stay during your business trip in Tel Aviv. 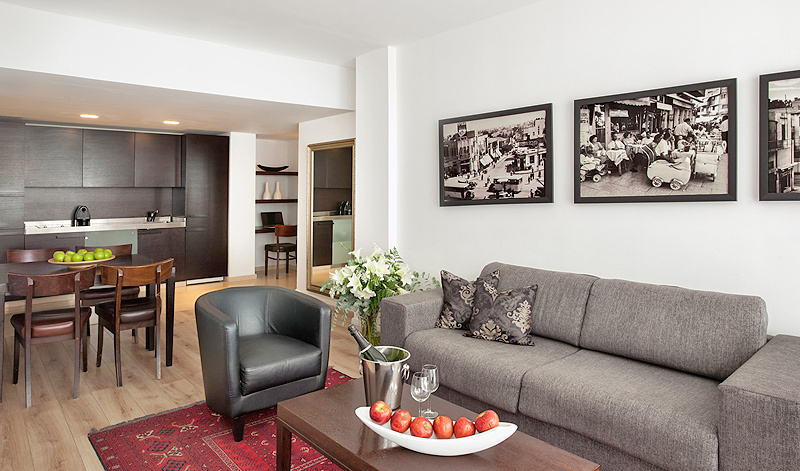 This classic suite, which comfortably accommodates up to four people, is also well suited for families and couples. The suite features a master bedroom, Jacuzzi, a multipurpose living room with a comfortable sleeper sofa, which can also double as study area and conference room, a fully functional kitchen with breakfast area and elegant parquet flooring. Standard Sea View RoomWith a panoramic view of the Mediterranean Sea, this 25 square meter (270 square foot) sea view room is both comfortable and functional making it an ideal choice for couples and single guests, and includes all the essentials for a business traveler on the go. 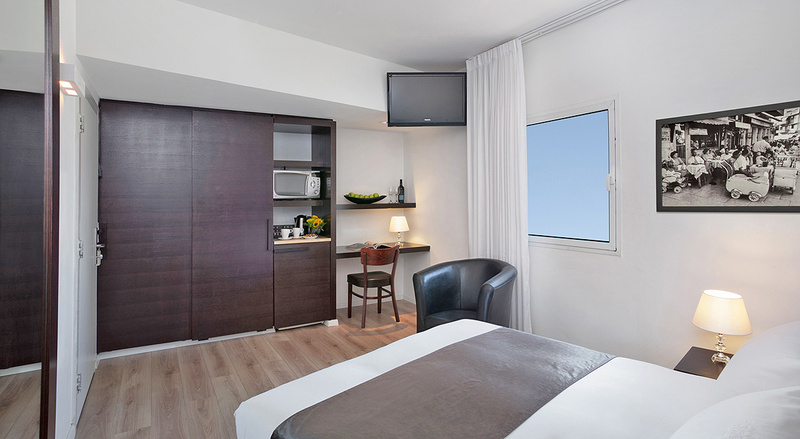 The room features a multi-functional work space, a mini-bar, microwave and the option to include a baby cot (suitable for children under the age of 2). Balcony is not guaranteed. Standard RoomWake up to the rhythm of Tel Aviv city life in this charming 18 square meter (200 square foot) room, perfect for single guests, couples and business travelers on the go. 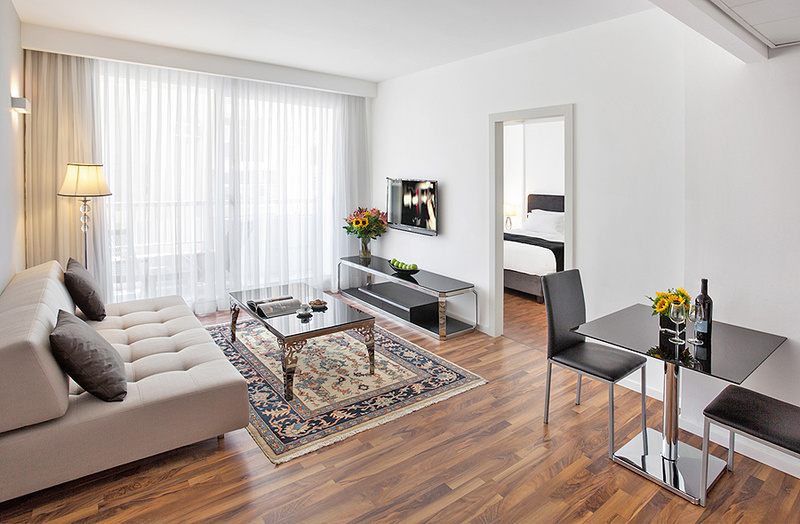 The room is both comfortable and functional making it an ideal choice. Featuring a multi-functional work space, a mini-bar and microwave.